Model T Ford Forum: OT - How would you like to see this Ford Racer? OT - How would you like to see this Ford Racer? Model T Ford Forum: Forum 2014: OT - How would you like to see this Ford Racer? Henry Ford began developing the six cylinder racer shortly after the new year in 1904. By the summer of 1904 he had a motor underway, and spent the next several months perfecting the racer. By January 1905 the racer was ready to compete and while warming up at Ormond Beach (Daytona), Alexander Winton and Barney Oldfield saw the racer run, and commented to the press that they thought it would set a world record. As fate would have it, the racer's crankshaft broke shortly after, and the car did not compete. In two later competitions that year, the racer set a beach record at Atlantic (Ventnor) Beach and set a world one mile competition record that was later reversed by race officials. By 1907, Ford updated the racer, increasing the cylinder size and making several changes, including using the now famous wishbone to engine front suspension change. With 6x6 1/2 inch bore/stroke, the racer would be just over 1100 cubic inches. The racer would make additional attempts at the record, with reports of unsanctioned times of 49 seconds. 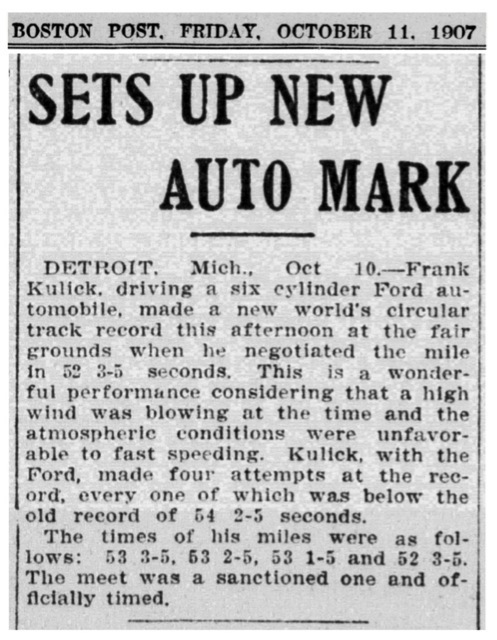 When Frank Kulick attempted a sanctioned time trial, he wrecked, and Henry Ford famously said he was through with racing. 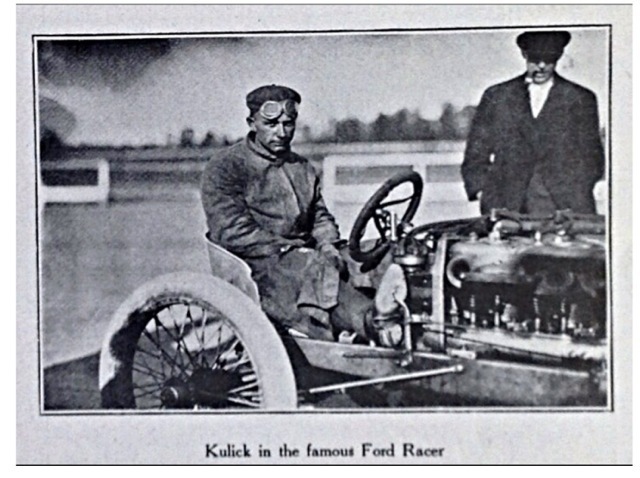 This racer would languish in a corner at Piquette, until the summer of 1909, when Henry Ford said he would rebuild the racer and allow Frank Kulick to attempt to set world records with the car at the opening of the Indianapolis Raceway. However, by late summer 1909, engine size restrictions with a maximum size allowed of 600 cubic inches made the racer obsolete. It would not run again. However, the racer still exists, and is not on display, but still at The Henry Ford. I would like to generate support to have this important part of Ford racing history displayed at next years Old Car Festival. The racer, between 1905 and 1909, was one of Ford's longest serving and fastest on the planet. Let me know if you would consider sending a letter or email supporting the effort to have the racer displayed next year. Good on ya Rob!! I would really like to see that racer!!!! Bud. Rob - I'd really like to see that racer too, and hopefully hear it run. Man, it must be a beast! Yes, I'd be willing to send a letter or email to support bringing the racer out for OCF next year, absolutely! Doug, hope we are able to get it out for all you "down under" visitors. Will you bring Bob T. along? Bud and Keith, I'll get in touch when we know a good contact to send email to. I just noticed something. 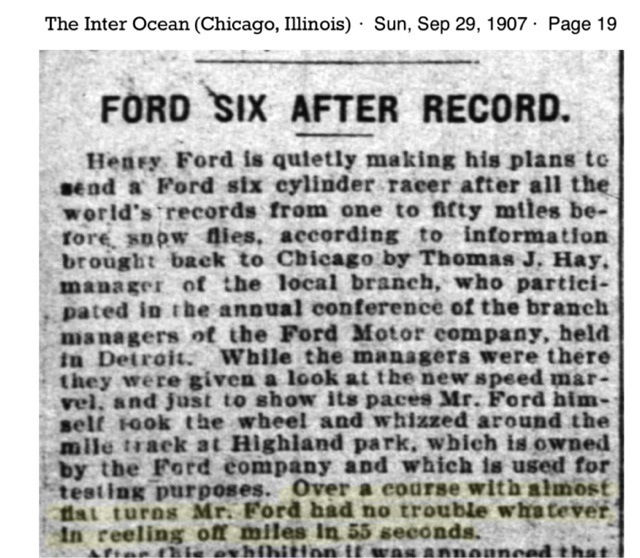 The six cylinder racer has another "Ford first." Any ideas what it has that no Ford before did? Mike, I believe Ford racers Sweepstakes, 999/Arrow and the "baby" or "skeleton" 20 hp racer of 1904 all had wire wheels. Do the guys at Greenfield village who work on the T's have any pull with the HF? We could ask them for help. I would think they probably know people on the museum staff. I don't know how the museum, Greenfield Village and Library are organized. Are they all employed by one entity? My intention is to find out who makes the decision about which cars to display at the tent during Old Car Festival and let that person(s) know of our interest in the racer. Ideally they would bring out their Model K too. One of the "Oral History" interviews claim the Model K at Greenfield Village was Henry Ford's personal car.